The second post in my “reviews” category answers the most common question I get regarding software: “What program do you use to create website templates and themes?”. Notepad++ is basically a plain text editor with added features that makes it easier to edit code. The program, which is free and open source, features customizable color coding for a large number of scripting and programming languages, as well as for regular HTML and CSS. Using the built-in style manager, the user can adjust colors, font sizes, formatting and other relevant settings for each code format independently. The editor has several display modes, including a dual-pane window that allows two documents to be displayed side by side. It is my default mode, most often showing a .html file on one half of the window and a stylesheet on the other. Notepad++ has a plugin system that allows more features to be added, for example an internal FTP client and a DIFF viewer to compare and display differencies between two documents. Using a tab interface, multiple documents can be opened and edited which I find useful for editing WordPress themes (which often consist of more than 15 different files). By default, there is no web browser intergration so I use my regular browsers to view the pages I design. Microsoft Windows and knowledge about the scripting or programming language that you intend to edit. Who can Notepad++ be useful for? Notepad++ is useful for programmers, developers and designers who use computers running Windows as the operating system and who edit code manually. It is especially good for people who need to work with multiple text/code documents open at once. The dual-pane viewing mode is a simple but really useful feature that many developers and writers find essential. Notepad++ can also be useful for anyone who is interested in learning more about HTML and CSS, as all editing is done directly in the code rather than in any visual editor that hides the code. 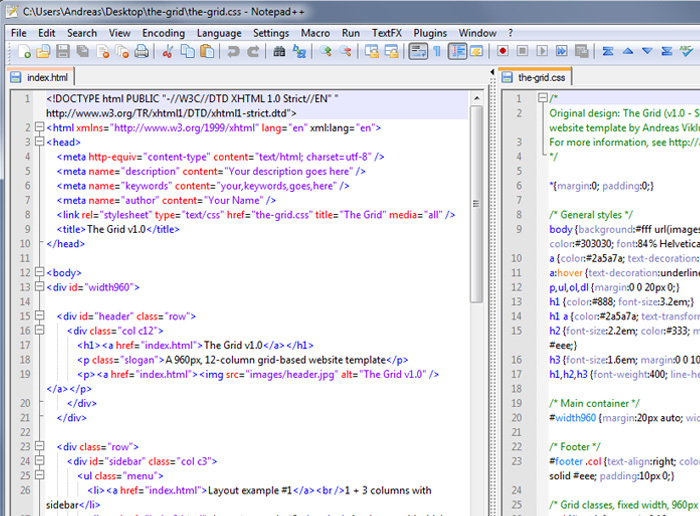 As it is my own favorite editor, I can definitely recommend Notepad++ for code editing. But for a web design beginner, there is a learning curve that could be easier to handle by starting with a combined code editor and visual editor that allows the user to view the effects of changes to the code directly with a visual preview. I will be writing about such editors in future posts for sure, I am currently testing a couple of software solutions that can be better starting points for beginners. But for anyone who shares my passion for manual coding: Try Notepad++ if you haven’t done it already. Chances are big that you’ll like it. How do I toggle between single- and double-pane editing? Open two (or more) documents, right-click on the tab you want to move to a second pane and select “Move to other view”. After that, documents can be moved freely between the two panes. Honestly, I am browsing internet for a while and I have never stumbled upon Notepad++. I have been using he old version of classic notepad but I will give this one a try! Excelent editor I am using it from more then 5 years… thanks to “Don Ho” for providing notepad++. Any way I could create a shortcut to do this? If you have the time to answer, I’d really appreciate it.